If you continue to wish you had your college degree, stop wishing and make it happen. No matter how long it has been since you were in the classroom, it's not too late. 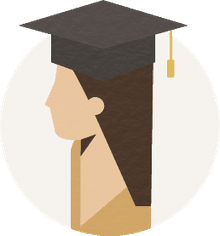 Whether it's your first time for college, or you've been dreaming of completing your degree, taking these easy steps will get you closer to graduation. Going back to school sounds glamorous, but it’s really a whole lot of hard work. Are you ready? Make sure you know what you want and have the support you’ll need in place before you set out on your new adventure. Once you've decided, write down your goal. Did you know that people who write down their goals are more likely to succeed in realizing them? There are assessments and quizzes available to help you figure out what you’re good at and what you like to do. Do you know your learning style? It can help you determine the best way for you to go back to school. Once you’re sure it’s the right time to go back to school, make sure you know exactly what it is you want to study so you know which path to take through school and which degree to get. That sounds obvious, but it’s an important step. What will you do with your education? Are you getting the right degree for the job you want? Career counselors are available in almost every city and at almost every school. Check your phone book, search online directories, ask your local librarian for help, and, of course, inquire at your local schools. If you don’t like the first counselor you meet, try another. Finding someone you like and can relate to will make your search so much more enjoyable. It’s your life you’re talking about. Now that you know what you want to do and which degree you’ll need to do it, it’s time to decide what kind of campus is better for you, a physical classroom or a virtual one. There are benefits to each. Is cost an issue? Online courses have different costs than traditional courses. Do you learn better in a social setting? Or do you prefer to study on your own? Do you have a quiet place at home and the technology you need for online learning? Is there a local school that offers the degree you want, and is it convenient? Are you the kind of student who needs face-to-face time with your teacher? Do you have reliable transportation if you choose to learn on campus? Online learning is becoming more and more popular every year. While it's not everyone's cup of tea, it's perfect for busy adult students who are self-starters and have busy schedules. There are a lot of different kinds of schools out there. You have options depending on the degree you’ve chosen. Learn the differences between colleges, universities, and technical, community, junior, or vocational schools. Find out where they are in your area. Call and ask for a tour, a meeting with a career counselor, and a catalog of courses. You’ve chosen a school, and in the process of choosing, you may already have met with a career counselor. If not, call and set up an appointment with the admissions counselor. Schools have room for only so many students, and the admissions process can be rigorous. If you’re ready for school now, financial aid is available in the form of scholarships, grants, loans, and other creative means. Depending on how long you’ve been out of school, your study skills might be a tad rusty. Brush up on them. Going back to school is going to require some shifting in your daily schedule. Effective time management will ensure that you’ve got the study time you need to get good grades. Those of you who are Baby Boomers have seen a lot of technological change in your lifetime. You’re probably more adept at some of it than others, but at the very least, if you’re going back to school, you need to be competent on a computer. Are There Special Education Jobs That Do Not Require a College Degree?